How can we be sure the email provided by the respondent is valid - that is not just following the a@b.c syntax but fully registered to a real address? The classic way is to send an email to the respondent in which they are asked to click on a link. The link usually updates a database and that database is then read to ensure the address is live. 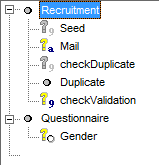 We will use the Seed as a unique respondent identifier to send parameters to an .asp page and to write / retrieve data to an external database. The seed is a unique number among all interviews across all surveys (in IT, a seed is a number used to generate random numbers - in Askia surveys, the Seed is actually used to uniquely define rotations in an interview). Here we will use an MS Access DB but of course, it's better (as in more reliable and more scalable) to use a SQL server DB. and if checkDuplicate has a value > 0, we know we have a duplicate in our database. In this example a message is displayed and the survey should be abandoned there. sql="UPDATE Recruitment SET State=1 WHERE Seed = " & request("seed") & ""
This is quite bare but what we do is simply change the value of State for the record which has the matching value for "seed"... and we show a polite message asking them to close the window. I am not going to get into too much detail here but we are creating a timer which calls another asp page (called getValidation.asp) every 200ms. It's an AJAX call - this means that the screen will not be refreshed unless we need to do so... and then we only refresh a small part of the screen with a message (in green) that indicates we may go on! sql="SELECT State from Recruitment where Mail = '" & replace(request("mail"),"'","''") & "'"
And that's it! You have a proper recruitment survey!